Modiano, Patrick. “Missing Person” (“Verba Mundi”), translated by Daniel Weissbort, David RGodine , 2004. Patrick Modiano brings us a man in pursuit of the identity he lost in the murky days of the Paris Occupation that is here referred to as, the black hole of French memory. For ten years Guy Roland has lived without a past. His current life and name were given to him by his recently retired boss, Hutte, who welcomed him, a onetime client, into his detective agency. Guy uses Hutte’s files as well as his directories, yearbooks, and papers of all kinds going back half a century but he has few leads. Could he really be the young man remembered by some as a South American attaché? Maybe he was someone else—maybe he is disappeared scion of a prominent local family. He interviews strangers and is half-clues tantalize him until, finally, he finds something that leads him through the maze of his own repressed experience. At first I thought I was reading a detective thriller but I realized that this book has another level. It is also a meditation on the nature of self and as that it is haunting. It is not just the story that pulls the reader in; it is also the lush prose of Modiano that has been beautifully translated by Daniel Weissbort, draws his readers into the intoxication of a rare literary experience. 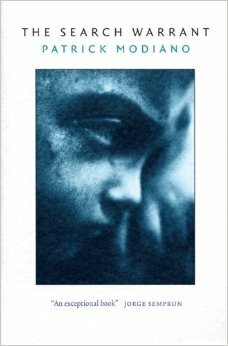 Some thirty years ago, this book won the Prix Goncourt (before it was translated into English). It was then described as an “elliptical, engrossing rumination on the essence of identity and the search for self. It is set in postwar Paris and follows an amnesiac now known as Guy Roland. When his boss retired, Roland set out to find his past. He conducted this most personal of investigations and began to suspect that he might have used multiple identities and these caused him to live a mysteriously compartmentalized existence. He might even have been fleeing the German occupation when his memory was wiped away. Is it through Roland’s explorations that we understand the author’s observation that we all live in a world where “the sand keeps the traces of our footsteps only a few moments.” The human is driven to preserve those footsteps for as long as he breathes. Modiano’s uses the subjects of mystery and horror, indicating them without outwardly talking about them and as he does he opens the doors to the past. What makes the book so wonderful is that it is so vague. Europe becomes a maze and Roland walks around inside of it. There are no points of references and no orientation but there is a sense of confidence. The first few lines had me hooked and I found it hard to understand that this book was originally published in 1978 (in French) yet it is still very relevant today. The idea is simple—a detective, suffering from amnesia, sets out to recover his identity, following a variety of strange leads. “I am nothing. Nothing but a pale shape, silhouetted that evening against the café terrace, waiting for the rain to stop; the shower had started when Hutte left me.” In just three words, the first sentence has us asking questions. 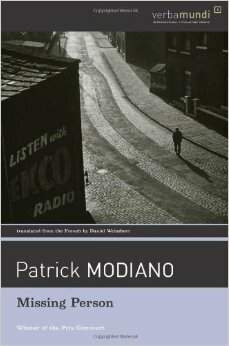 Patrick Modiano is the first important French novelist to investigate the memory of Vichy and the recovery of life in a post War France. The concept is totally implausible— Modiano is less interested in the mechanism of Guy’s search for self than in what that search will reveal. The detective will follow a number of clues, each time finding somebody who will give him a tiny part of his story, but not the whole of it. Almost all his informants seem glad to talk with him; they invite him to their homes and give him boxes of souvenirs to go away with. This, even as Guy himself is having to pose as someone else to gain their confidence, trying on one possible role after another, as he gradually works out who he must be. And, as he does so, he begins to have flashes of memory of his own. Modiano has said publicly that many of his novels use memory to explore the experience of his father, who was Jewish but survived the occupation. That does not appear to be the specific theme here, although references to “those years of night” crop up increasingly among the protagonist’s informants. Whatever interpretation one chooses to give to the book shows that the reader has been impressed with what he read and to me that is one of the qualities of literature—it makes us think. This entry was posted in Judaica, Patrick Modiano on October 22, 2014 by Amos. Modiano, Patrick. “The Search Warrant”, Random House UK, 2000. When a Nobel laureate in literature is announced, most of us have not ever heard of him before and a mad rush to read whatever we can find so that we may judge if a recipient is really deserving—for some reason we seem to think that our opinion is as important as the Nobel judges. The Nobel Prizes are awarded by the Royal Swedish Academy, academics and thinkers who have been appointed to lifetime memberships. The Academy elects, from within its own members, The Nobel Committee for Literature, which invites distinguished academy members, previous laureates and other qualified nominators from around the world to nominate authors for the prize. From the nominations they receive, the committee selects a short list of candidates. The final choice is made by the full 18 members of the Swedish Academy, who review the life’s work of the nominees chosen by the Nobel Committee for Literature. The Nobel Prize in Literature has been the subject of considerable controversy over the years. The prize has been criticized for ignoring some seminal authors such as Vladimir Nabokov, James Joyce, Virginia Woolf and Leo Tolstoy, while being bestowed upon other authors who have since languished in apparent obscurity. The sheer scope of the Nobel Prize presents an obvious challenge; with literature from across the globe open for consideration, it would be difficult for the Academy to recognize each highly acclaimed author from each literary tradition around the world. This breadth of consideration, as well as the relative opacity of the process, keeps critics and odds makers guessing each year as to what direction the Academy might take. Modiano, 69, is the author of more than two dozen books and several screenplays. The 11th Literature laureate born in France, Modiano is also the recipient of the Grand prix du roman de l’Académie française, the Prix Goncourt, the Prix mondial Cino Del Duca and the Austrian State Prize for European Literature. “The Search Warrant” is set in December 1988 and has a bit of a back-story. While researching documents dating back to the Nazi Occupation of Paris, Modiano came upon an old notice in the New Year’s Eve edition of Paris Soir, 1941, placed there by the parents of a young Jewish girl, Dora Bruder, who had escaped from the convent that was hiding her during this period. Fascinated by what happened to the young girl who chose to run away on a very cold winter’s night and at the height of German reprisals, Modiano set off on a quest to find out all he could about her. However besides a mention of her name in the list of Jews deported to Auschwitz, the details of her existence remain an impenetrable unknown. What little he discovers in official documents and through remaining family members, becomes a meditation on the immense losses of the period—lost people, lost stories, and lost history. Through this young girl, Modiano delivers an account of the ten-year investigation that took him back to the sights and sounds of Paris under the Occupation and the paranoia of the Petain regime as he tries to find connections to her. Through his investigation, Modiano looks for Dora, and for his own father who was also hiding in Paris of that time. The idea of tracing the movements of a single person, who at first is anonymous but through the skill of Modiano becomes a real person with whom the reader can sympathize, makes one as sad as if a close relative had been unjustly killed. This is most certainly not an easy read and plodding through the text might just be an accurate description of what there is here. As we plod, Modiano brings us into his story and we are soon swallowed by it while loss of memory reigns within the author’s words. Secrets remained secrets despite the collusion of history and time. We see that memories are fallible and often inadequate to capture the past and we therefore have to rely upon decaying documents and unclear memories of others to get to the truth. I must stay that I was stunned by the book and even though I read it in translation the words and language are gorgeous.